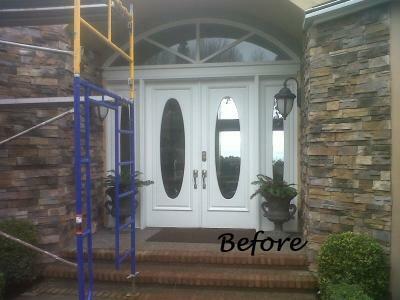 Our next door in our "Before and After" series is this beautiful iron door with sidelights and an arced transom in Edmonds, WA. The hand forged iron scroll work and antique bronze finish compliment this homes stone work and seem to bring the entry way to life. 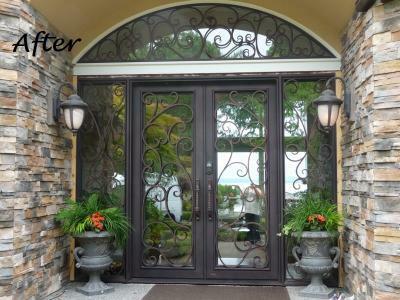 This one of a kind iron door provides security while maintaining elegance. To complete this distinctive look we can provide our customer with a custom iron garage doors and wrought iron railing to match the scroll work of this door, and truly set this house apart from the rest. Now our customer can have the confidense in knowing that when the neighbors drive by, they can't help but look.